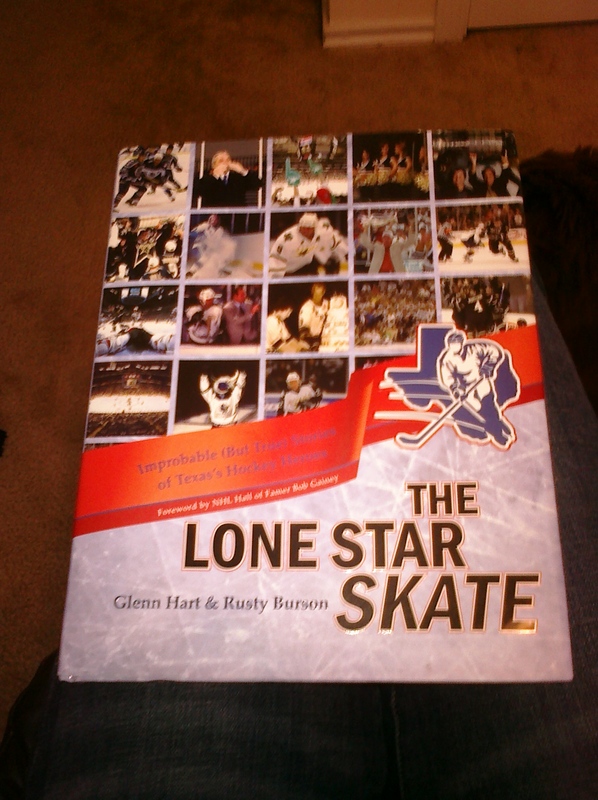 Carissa Lucas, from Phoenix & Phoenix Literary Publicists, contacted me a little while ago about reviewing a book about hockey in Texas. Well it arrived today and I’m super excited to read and review it! Happy December everyone! I am really glad that this Movember thing is over, and that I’ll get to see 23 clean-shaven Stars tonight at the pregame skate. The Stars are riding a 4 game winning streak, and I’m sure they’d love to make it 5 in a row against the Capitals tonight. 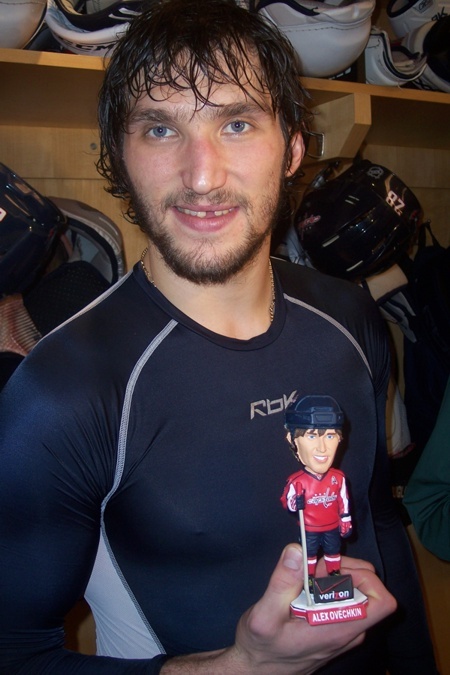 This is the first time since 2008 that Ovechkin has come to Dallas. The Caps have been playing very well recently and are leading the Eastern Conference, even though Ovie has only scored 10 goals so far this season. Maybe he’s becoming more of a team player? There should be a pretty big crowd at the game tonight, but I expect there to be a lot of Caps fans. 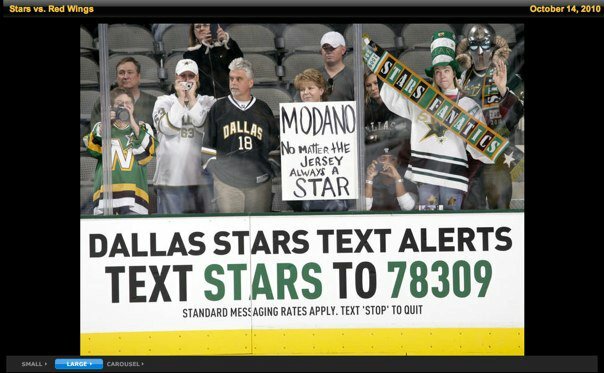 The Stars have also been flooding my email inbox telling me that I can still buy tickets for the game tonight so they’re pushing it pretty hard. Maybe one of these days we’ll have a sellout. Who to watch tonight: Obviously Ovie is going to draw a pretty decent crowd, but Jamie Benn has a goal in each of the last 3 games and has been playing very well. Neuvirth should be in goal tonight for the Caps and he held Jamie scoreless in the Calder Cup Finals earlier this year. Look for Jamie to get a little revenge! You can follow live updates throughout the game on our Twitter page here! First period, in which the Stars dominate a tired Sharks team: The Stars played well, up until the last minute when Trevor Daley’s mental facilities collapsed and he allowed a weak rush from San Jose to lead to a goal. The Stars ended the period 2-1 with goals by Richie and TRD (a powerplay goal!). Nichol had the goal at the end of the period for the Sharks. Second period, in which the Sharks get physical and the Stars fall apart: The 2-1 lead turns into a 3-2 deficit as some guy named Pavelski scores and Couture adds another. Jamie Benn wins his third fight of the year against Setoguchi, and Richie (?) starts something with Mitchell and they end up with 10-minute misconducts because the fight started before the puck was dropped. What this means: Richie doesn’t technically have a “fight” to his name, and it ruins his chances for the Lady Byng at the end of the season. Third period, in which we sit dejected until the last 3 minutes: Marleau scores in the first half of the period to make it 4-2, and many fans leave the game. We warn them that they are going to miss the comeback and shootout victory for the Stars, but they give us dirty looks and rush to get out before traffic is too bad. But with the attendance this season, that’s a pretty poor excuse to leave because there aren’t enough people at the games to make traffic a hassle afterward. The Sharks score a 5th goal, but it’s disallowed because of a high stick and there’s a little life in the Fanatics section. We start cheering again and wonder if maybe the Stars can pull something out of this. All of a sudden, something wakes the Stars up and TRD gets his second goal of the night with less than 3 minutes left. All 3000 of us who stayed are rejoicing, and… it’s actually pretty loud in there! 29 seconds later Ribs does it again for his FIRST GOAL OF THE SEASON! On the next faceoff, it looks like Ribs has scored again, we all have mini heart attacks, but then realize there was no goal. Here is some super high quality video of the end of overtime and the goal celebration for Ribs. Not many of us stayed, but I was surprised at the volume level. and in The Hockey News! Before I get to any criticisms, I think it’s important to recognize one of the best moments of this season. It had nothing to do with NHL hockey, but was still very important to the Stars and hockey. 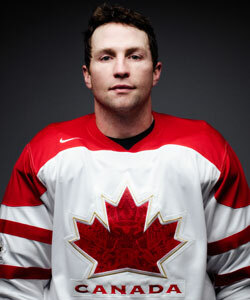 Canada won the gold medal, and my faaaavorite player, Brenden Morrow played a major role in winning that medal. Now there have been a lot of people throughout the season who have complained about Brenden’s level of play while he was with the Stars. They first blamed it on his knee, saying it must not have been completely healed from the reconstruction or that Brenden wasn’t mentally ready to play again. Then he went to Vancouver and played wonderfully for Canada, and ended up being a major part of the team. After this, most Stars “fans” went crazy on Brenden, saying he was lazy, didn’t care about the Stars, should have his captaincy taken away, etc. I say “fans” because most of these comments came from Heika’s Blog, and we all know that a lot of people who comment there are mentally fragile. First off, Brenden is FROM Canada and obviously wanted to play in the Olympics IN Canada. He said that winning the gold medal was his biggest dream when he was growing up. Maybe I’d like his biggest dream to be winning a Stanley Cup as captain of the Stars, but if winning a gold medal is it, then that’s what I want him to accomplish. So maybe he didn’t play his hardest once he got named to the Olympic team. He didn’t fight with Avery when the Stars went to New York. SO WHAT? We have other enforcers on the team and I don’t blame Brenden one bit for not wanting to fight with that little piece of… you know. I don’t blame him one bit for not being as physical. He didn’t want to get hurt and miss the Olympics, and you can’t fault him for that. Especially the possibility of getting hurt by someone like Avery. Also, his role for Team Canada was drastically different than it is for the Stars. He played on the 4th line and rarely saw power play or penalty kill time. He wasn’t asked to play in every situation, be physical, and score goals at the front of the net while skating 20 minutes a game. He only played a few minutes a game for Canada (although that went up as the Olympics went on), and he put everything he could into those few minutes. After Canada won, several people went so far as to tell Sarah and me that we were “terrorists” because we wanted Canada to win instead of the US. Seriously? I guess these are the same super intelligent people who think Brenden should have the captaincy taken away. Although most of the people telling us this weren’t even hockey fans and were just cheering for the US because it was the Olympics. That tiny bit of hockey doesn’t give you the right to tell me who I can and can’t root for. I wanted Brenden to win the gold, and I’m damn glad that he did. I can see how it’s kind of unfair that the US only lost one game and was handed the silver medal. I think the Olympic tournament needs to be restructured. Why is it necessary to play a full week of games before actually playing for real? Why not seed the teams based on the way they finished in the previous Olympics? Maybe that’s not the best way to do it, but playing two full weeks of games that mattered would offset seeding them based off the previous Olympics. I didn’t even think the US team would make it to the medal rounds, and they surprised everyone. They deserve so many accolades for how well they played. 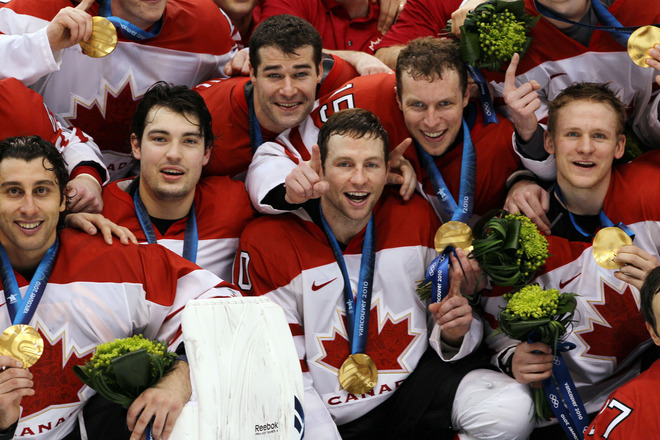 Watch for them in 2014 (if the NHL goes to the Olympics in Sochi), because a lot of those players will be back, more experienced, and probably still pissed they got the silver in 2010. Even though the US played well, Canada deserved to win the gold medal on their home soil. I know there were a lot of people in the US cheering on the American team, but 80% of Canada’s citizens watched at least part of that hockey game. That would be equivalent to 240 MILLION Americans watching the game. I don’t even think that many people watch the Super Bowl. 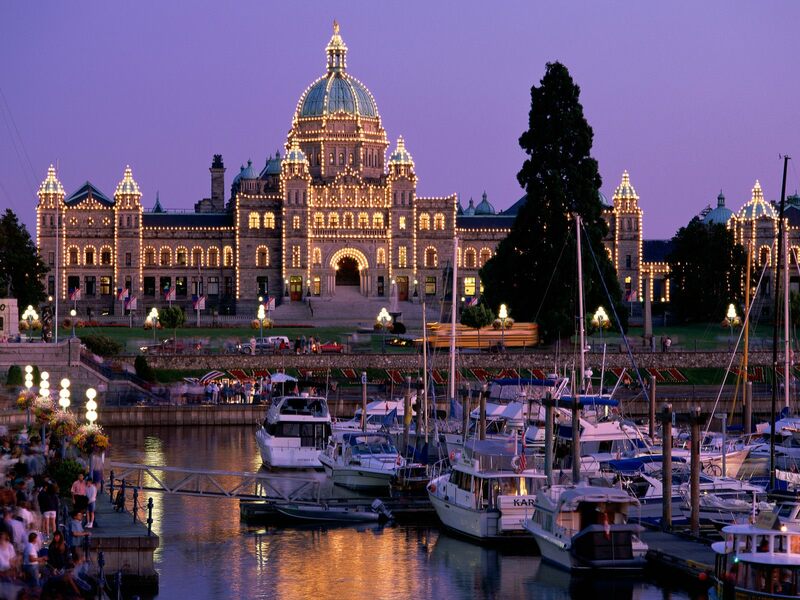 People in the US were invested, but it doesn’t even compare to Canada. There weren’t parties in the streets in any American cities, but people came out to the streets in Vancouver, Toronto, Montreal, and Ottawa to cheer on the team and celebrate the gold medal. Would you have seen this anywhere in the US? I don’t think so. Although, if you do, let me know because I’d love to be there! Canada deserved it, and the ending to the Olympics was perfect because of it. Congratulations to them! 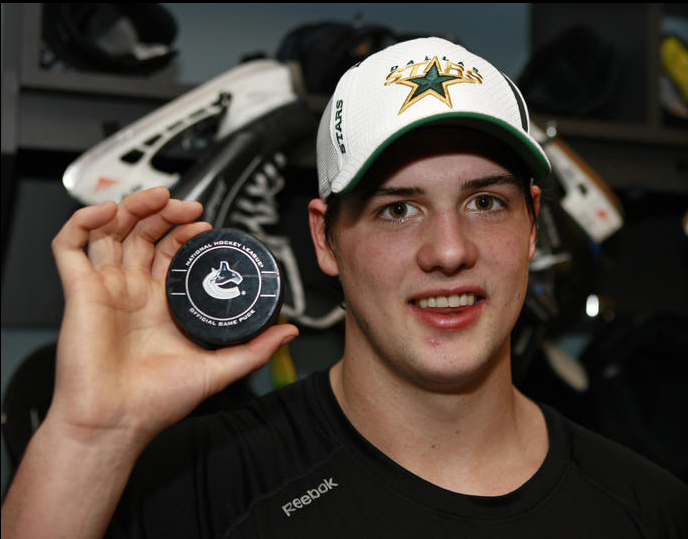 And now that he’s won a gold medal, Brenden’s new number one goal can be to lead the Stars to a Cup. Although he’s gonna need a ton of help with that. I am so proud of Brenden and so happy that Canada won. I thought of this while watching the playoffs last night. I feel so removed from the playoffs since the Stars haven’t made it for the last two seasons, that I really don’t care what happens. Well, I’d really like to see Phoenix and San Jose lose, but I just don’t care a whole lot. I’d much rather talk about the few good things that happened for the Stars and Stars players this season. 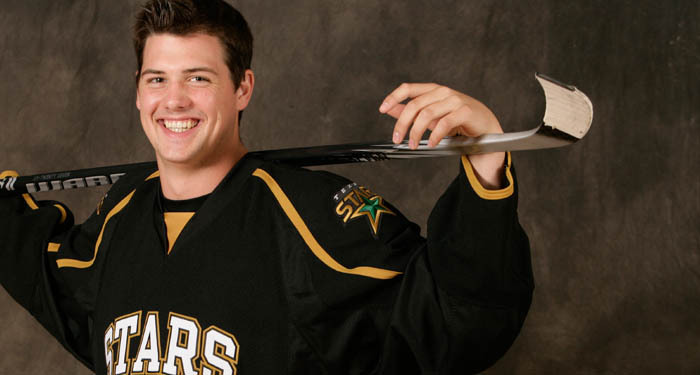 So without further ado, I present to you the best aspect of 2009-10: Jamie Benn’s rookie season! Jamie had an amazing season his last year in juniors. In the regular season with Kelowna, he had 82 points (46 G, 36 A) in 56 games. He missed a fair number of games in the regular season while he played for Canada in the World Junior Championships. They won the gold medal, partially thanks to his contributions. 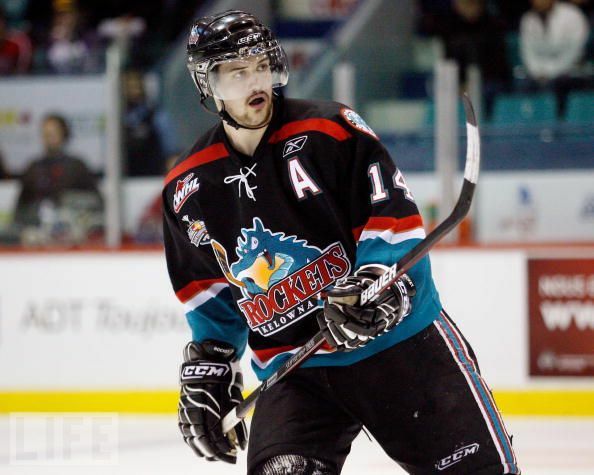 Jamie was on fire in the playoffs for Kelowna, as he had 33 points (13 G, 20 A) in just 19 playoff games. He even missed a couple games in the playoffs after taking a cheap hit from one of the Calgary Hitmen (actually Brent Seabrook’s little brother – ugh!) during the WHL Championship series. Jamie’s technique tip for the videos done for the World Junior Championships. When most of you first saw Jamie, it was probably at the beginning of training camp. From the start of camp, Heika, the coaches, and the rest of Jamie’s teammates began talking about just how good this kid from Victoria was. He wasn’t even expected to make the team this season, and the coaches had penciled him in to start the season with the Stars new affiliate in Cedar Park. I had kind of penciled that in as well, since Cedar Park is almost 3 hours closer to me than Dallas is. After the first week of training camp, it was pretty obvious that he was going to be staying up in Dallas. Crawford said a few times that Jamie was the best player at training camp, not just the best young player. He had goals in almost all of the preseason games he played in and seemed to be off to a really strong start. He had a great rookie season, scoring 22 goals and adding 19 assists for a total of 41 points. Those aren’t quite the same numbers he put up in juniors, but that’s to be expected since the caliber of the defense goes up a whole lot in the NHL compared to the junior leagues. He even made the move to center for the first time in his career, and I think he handled it wonderfully, except for knocking out several of James Neal’s teeth in his first game at center. Next should hold even more possibilities for Jamie because I think he really got more comfortable as the season went on. His scoring went up as the year went on, and we started to get more glimpses of just how dominant he can be when he gets the puck. As Ralph and Razor said at the end of the Minnesota game last weekend, it was only fitting that Jamie score the last goal of the season as a symbol of how he’s going to one day be one of the important leaders of the team. 2. Krys Barch was his roommate on the road last season. Talk about a nice introduction to the NHL! With Barchie’s future in question for next year, Jamie may be looking at getting a new roommate. 4. His older brother, Jordie, plays for the Allen Americans (who are currently in the CHL playoffs). Even though Jamie’s the younger brother, he’s the one who managed to make it into the NHL. I think that happens relatively often because the younger sibling is forced to play at the higher level as the older sibling to cut down on traveling, cost, etc. 5. He has an awesome shot. That practicing the quick release must really help. I really wanted a video of the goal he scored December 23rd against Columbus, but I couldn’t find one. Someone like me should be cataloging all of his goals for posterity, I guess. 6. Even though the season is over for the Dallas Stars, Jamie Benn went down to Cedar Park to give the Baby Stars some help in the postseason. He’s playing on the top line with Rallo and Gagnon and will probably get a fair amount of powerplay time. He scored two goals in his first practice with the team, so hopefully that bodes well once the real games start. While I wish the Stars could be the ones in the playoffs, playing for the Texas Stars should give him a lot of good playoff experience at the professional level. I think my favorite thing about Jamie is that he’s so humble and polite, even with everything that’s gone on his rookie season. He moved to a new country, played with amazing players such as Mike Modano, Jere Lehtinen, and others, managed to score 22 goals, and learned a new position. His mannerisms remind me a lot of Brenden’s, and it’s refreshing to see that young star athletes can be so humble (here’s looking at you, James Neal). My favorite players are the ones who lead by their performance on the ice and drag the rest of the team along with them. I look forward to everything that Jamie will do for this team in the future. Let’s hope he’s the only name on GM Joe’s “untouchables” list.